Perusing: Mike and I are perusing the episodes of S Town this week. I'm a podcast lover and a public radio fanatic (Wisconsin has an EXCELLENT public radio network). S Town is very good so far, and I highly recommend it. If you're not on the podcast train yet, get on it! Needing: Desperately needing a haircut. I haven't had one since . . . July, I think? Tomorrow is the day, friends! Analyzing: I had the monumental task of putting my laundry away this week . . . which led to some analyzing of my clothes situation. This is something I've been trying to tackle this month, but it's a little overwhelming. I put off my laundry as long as possible . . . and to be honest, I sew fast enough, that if it weren't for Mike, I'd probably do it six times a year. But the worst task is putting all this stuff away. I counted up what was RTW, and found out that 70% of the tops/dresses were me-made. I should get rid of all the RTW items, since I never wear them anyway. But I also need to get rid of some of the me-made . . . and I also need slow down the production line and be more purposeful in what I do make. My goal for me-made May was to actually get rid of some clothes and find out what items I actually do need (sweatshirts=yes, more dresses=no). Fantasizing: Oh my, oh my, I'm fantasizing about some kid-free time. A date night with my husband would be nice. But also, we have a vintage 1971 Shasta that we're overhauling this summer. 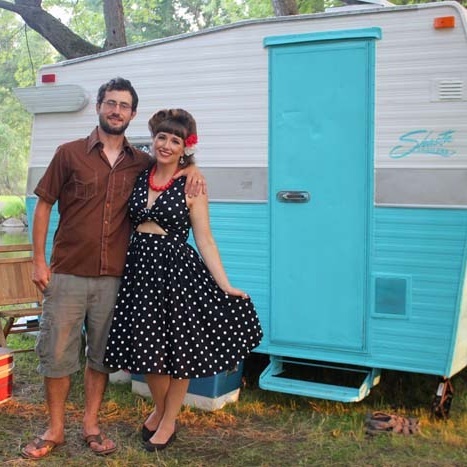 We do a mini getaway each year for our anniversary and this year, we just decided that we're going to take the Shasta out! I'm SO excited to do the Shasta project and have some time just the two of us. Link to my Pinterest board on our Shasta inspiration-- this thing is gonna be CUTE!